Focus Ireland says successive cuts to rent supplement limits are forcing people into such debt that they’re becoming homeless. SUCCESSIVE CUTS to rent supplement payments are forcing greater numbers of people into homelessness, a leading charity has claimed. 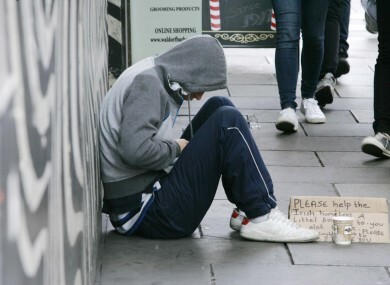 Focus Ireland made the claim as it warned that further cuts to rent supplement in next month’s Budget could increase the problem of homelessness, while also putting more families at further risk of ploughing into debt and losing their homes. The charity claims rent supplement payments have fallen by an average of 28 per cent in the last three years, on the pretense that cuts to supplements would force rental prices to fall, but that this has not been the case. Focus says because rental prices have held steady while supplements were cut, people were forced to dip into their own savings and make ‘under the counter’ payments to their landlords in order to maintain their housing. “They felt they were caught between a rock and a hard place due to the unwillingness of landlords to reduce the rent, and the difficulties in securing any other private rented accommodation under the rent supplement limits,” said Focus Ireland’s director of advocacy Mike Allen. Allen added that he hoped the report would serve as “a reality check” for government TDs who might be advocating further cuts to supplements in the Budget on December 5. The charity’s report included claims from one woman who said recipients had “no choice” but to top up their allowances with under-the-table payments in order to prevent themselves from being evicted. “It’s either that [pay a top-up] or go into a hell-hole and you can’t live like that either,” she said. The charity has advocated that the next review of rent supplement levels, due to be undertaken in June 2013, be brought forward to account for recent increases in rental prices in many urban areas. Social Protection minister Joan Burton has previously asserted in the Dáil that cuts to rent supplement would not resulted in additional homelessness, but the charity claims to have evidence of examples where landlords have refused to accept lowered supplements and evicted their tenants. Email “Cuts to rent supplement 'forcing people to become homeless'”. Feedback on “Cuts to rent supplement 'forcing people to become homeless'”.